Welcome to my site! Hope you enjoy the new look! I will try to update as many times as I can, please check back often for new updates! Ok, now that it's being said, let's begin! 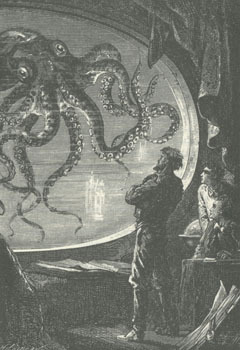 The Nautilus and its captain has fascinated me for years! Ever since I read Twenty Thousand Leagues Under The Sea by Jules Verne, finding new information about the Nautilus has always been a huge step for me, as I find information about its design, I will do my best to post them on this site, please follow me! Please feel free to browse the topics on the Navigation bar at the left to find more information on this magnificent ship! Up until a few years ago, I came in contact with the world of RC-submarines (Radio Controlled subs), afterwards, the building of an RC-Nautilus and several other RC-subs have come to mind, all other hobby topics related to this subject can be found in the Submania! 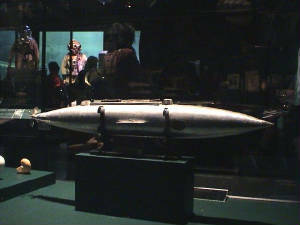 page, the worlds of Captain Nemo's Nautilus and RC-subamrines have finally come together in harmony!!! April 15th, 2006: Added a new album, pictures of the Jules Verne Exhibition at the Pointe-à-Callière Museum of Archeology in Montreal. Click the Nautilus picture on the right column to find out more!!! April 8th, 2006: Well, after a year's halt, I've finally decided to update the site! ;) From now on, new things will be added to the site, the theme will be mainly about RC-submarines and U-boats in general, and of course, the Nautilus pages will still be there! Nautilus model made by Jean Gagneux, this model was featured in an exhibition about Jules Verne's works at the Pointe-à-Callière Museum in Montreal. I took many shots from this exhibition, you can view them by clicking the picture above. ".....what one man can imagine, other men can do........."